Comments Off on Mark Tremonti on New Tremonti CD; A Dying Machine is a Progression in my Writing and Playing! What separates the innovators from the followers are the courage to do something different and be successful at it; to not only break the rules but rewrite the rules at every opportunity. To challenge yourself until something completely new and different is created that you own and excel at. 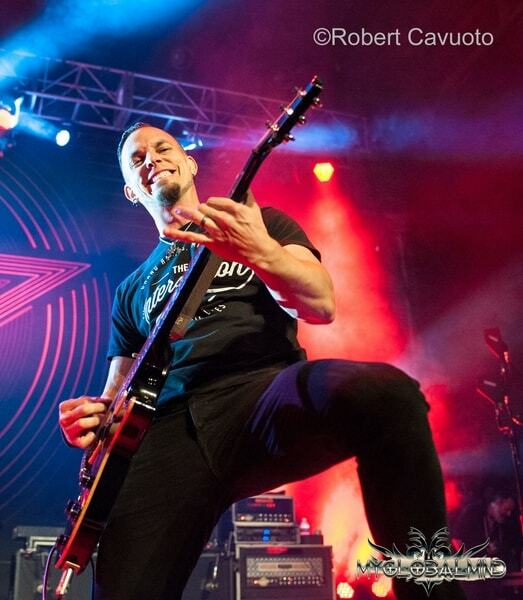 Mark Tremonti has always excelled at whatever he takes on whether it’s for Creed, Alter Bridge, or his solo band Tremonti – he is a guitar hero for a new generation of players. 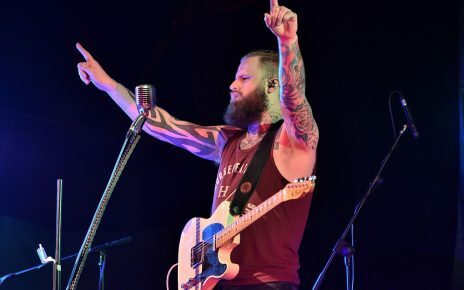 The album features Mark on vocals/guitars, Eric Friedman on guitars, and Garrett Whitlock on drums and is produced by long-time friend and collaborator, Michael “Elvis” Baskette. I caught up with Mark to discuss the making of the first concept CD and how he challenged himself both musically and lyrically! Robert Cavuoto: Can you talk a little about the vision you had going into A Dying Machine and maybe how you wanted it to be different from Dust and Cauterize? 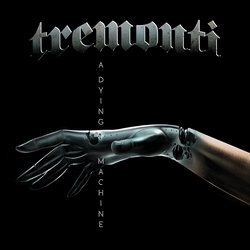 Mark Tremonti: This was my first concept record, and I feel by far it’s my best solo record to date. I couldn’t be happier. Robert Cavuoto: Do you think A Dying Machine is a progression in your writing and playing from for your other solo CDs? Mark Tremonti: Yes, because it’s the first time I tackled a concept theme. Lyrically I love taking down the story thought-out the album. This was a different way of attacking a record. Robert Cavuoto: What would be an example of where you outdid yourself on this CD? Mark Tremonti: Lyrically tying it all together into the story. I had a great time doing that and happy with the lyrics. I tackled the songwriting differently as well. Usually, I took parts of songs I had from years past and put them together, but this time I created each song individually. It took weeks just to get a song down. I did that song by song, and it just felt different. It’s all brand new stuff. Robert Cavuoto: You always make an effort to seek the ultimate expression in a song. Do you know what drives that artistic work ethic? 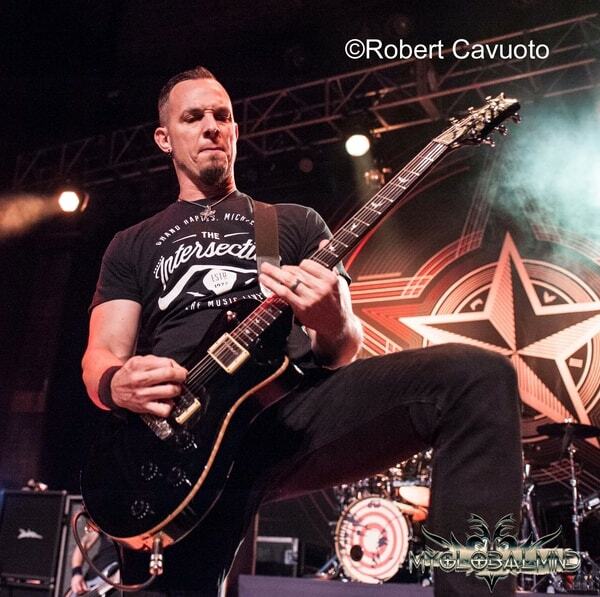 Mark Tremonti: Ever since I was a little kid I have always loved creating music. Writing has always been the thing that got me excited not necessarily the guitar playing but creating the emotional part. Since I was eleven years old, I have been recording on 4-tracks and writing trying to create that perfect song. Hopefully, I’ll be doing that until I leave this world. Robert Cavuoto: Do you have a favorite song or one that you feel is perfect? 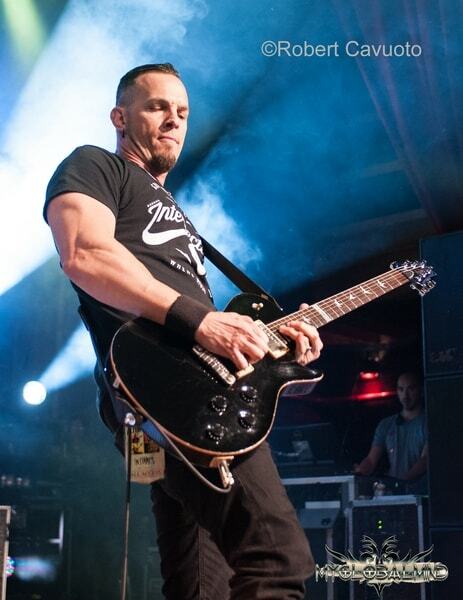 Mark Tremonti: I would have to say the song I wrote with Myles Kennedy called “Blackbird” for Alter Bridge. Robert Cavuoto: I don’t have the liner notes did Wolfgang Van Halen appear on the CD? Mark Tremonti: Eric played bass on the record. Wolfgang actually called me and wanted to record the bass, but we were already in the process of getting the bass going as Eric played the bass on all the demos. Wolfgang is also working on his solo record at the moment. Robert Cavuoto: Tell me about the creation of the song “The First and The Last” it’s a little glossier than the rest of the CD and my personal favorite? Mark Tremonti: That song is the big ballad of the record. I usually don’t tackle a song like that because of the subject matter as it’s a lost love type of song. I have never done that before, but since I had this concept going, I wanted to try new things and write from a different point of view. I tried to get into character and approach it from that perspective. Robert Cavuoto: How does your technique and tone factor into songwriting? 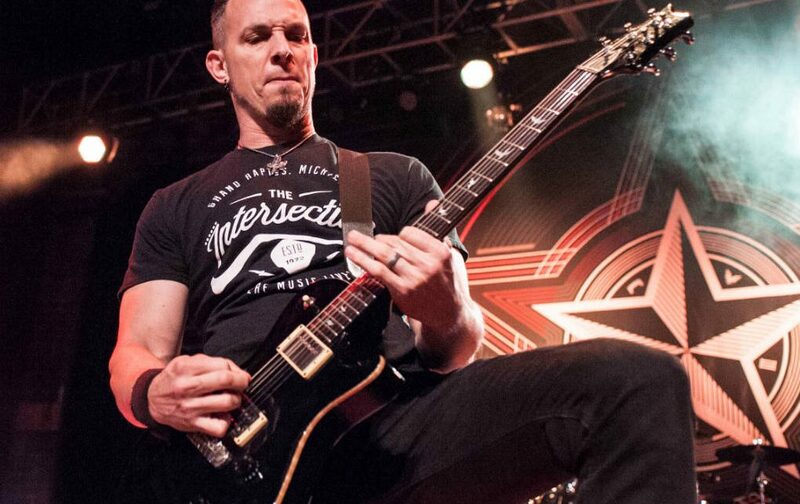 Mark Tremonti: When I’m writing songs I try to take the technical playing out of the writing. I try to make it as emotional as possible and then add the technique or “frosting” later. As long as the base melody and progression of the song is where I work from there. Robert Cavuoto: Have you reached a level of technical proficiency where you don’t have to push yourself anymore? Mark Tremonti: Absolutely not, [laughing] far from it. I have a long way to go. I grew up on a shredder side of playing, a lot of people like that don’t improvise well and don’t play the blues or jazz well. They know their techniques and run them into the ground until they are perfect. For the last 10 or 15 years, I had to relearn how not to be a stiff player like I was when I was younger. To be looser and be able to improvise with the band while playing over whatever it is they are playing. Robert Cavuoto: Was there ever a moment when your faith in guitar playing as a career choice was shaken? Mark Tremonti: No, it’s all I ever wanted to do! I’ve never sat back and said I’m a great guitar player. I always look at what great players were doing and figured out how I need to chase that sound or learn that style. It’s frustrating along the way, but it can be inspiring when you see someone doing it effortlessly. In time you can get there, you just have to be patient and stay passionate. Robert Cavuoto: I have never encountered such a rabid and loyal fan base for you and Alter Bridge, what do you attribute that to in such a short period of time. Mark Tremonti: We are blessed to have these fans. They know every single word, and they come and travel to every single show on a tour. They’re like a little family as they all travel together and know each other. I think it has a lot to do with the lyrics of the songs; it’s not just fun party music. It real life stuff with emotional lyrics as and I think the fans connect with that. Robert Cavuoto: Myles is going on tour with Slash what are your touring plans? 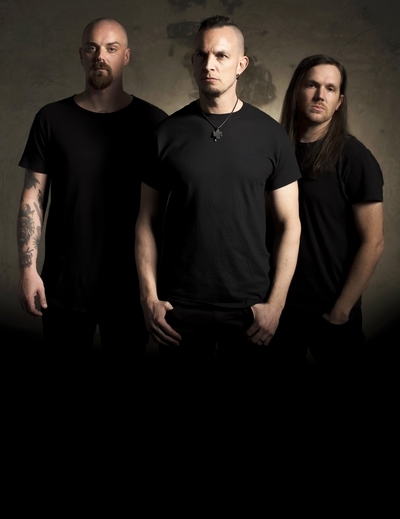 Mark Tremonti: We were on the road for a little while in the state, and now we are gearing up for a tour of Europe for seven-week with Iron Maiden. Robert Cavuoto: What is the status of the next Alter Bridge record? Mark Tremonti: Nothing yet, we are still gearing up for the Tremonti tour and getting the songs ready for the live performance. Once we get on the road and I begin to feel comfortable with the show and practice all these new songs. I’ll get into writing for Alter Bridge. Robert Cavuoto: My editor mentioned to me that you collect pinball machine? Mark Tremonti: I love pinball machines, and I’ve been collecting them for the last 15 or so years. I prefer machines from the late 80’s early 90’s like Medieval Madness, Twilight Zone, and Indiana Jones. I’m not into the super old machines as I don’t think they are as much fun to play. Pete and I worship Criss Oliva’s (Savatage) playing. Criss had a huge influence on my playing, he was a supremely underrated guitarist and I hope you can hear some of his style in both of our playing and hopefully a little bit of Randy Rhoads too. 3 years gigging and we’ve gone from plain pub gigs to selling out 400 capacity venues. You know it’s has been a quite steep climb.